Hey everyone! Welcome to a blog hop dedicated to all of you fabulous hosts/hostesses! All of the project you will see will feature our fabulous hostess sets!! Today, I am sharing a monochromatic project in black and white. It features the hostess set called, “Tranquil Tulips”. Be sure to click on the next link in the hop to see what everyone else has in store for you! 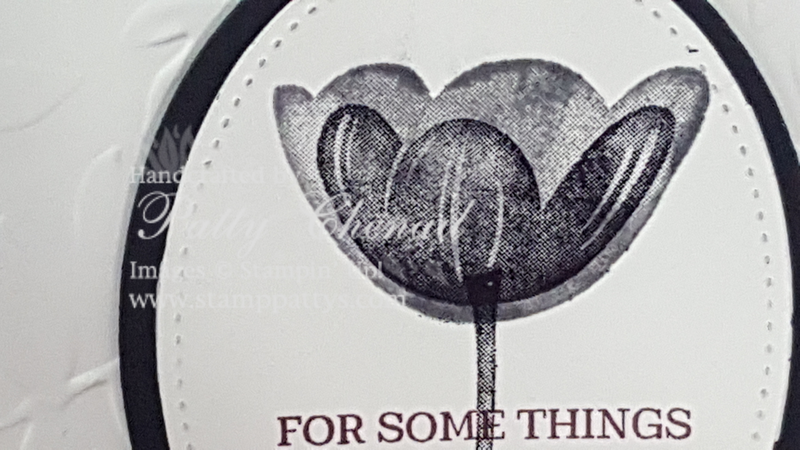 I used the archival black and grey ink pads for the tulip and then overlayed a greeting from the Rose Wonder stamp set using the new fig ink! I used the new Layering Leaves 3-d embossing folder for the white layer under the focal point. I don’t know if you can tell from my photo but the black shimmery ribbon on this card is absolutely beautiful! It is so nice to work with and has little bits of sparkly magic in it!! Thank for stopping by! Be sure to continue on the hop to see some other hostess inspiration!! Love the simplicity and the tulips is one of my faves. Fabulous in monochromatic! Love it! The black and white make for a very stunning card. Such an elegant monochromatic look. I love how elegant this card is and so simple to make too! Great one for classes! Very elegant! I love the simple black and white! Beauty! Love the black & white! I will repeat what everyone has already said – so elegant using the black and white and a bit of texture.